Interkapa Ltd was established in 2003. Its main activity is the trade of basic chemicals such as Sulphuric Acid, Caustic Soda, Hydrochloric Acid, Sodium Hypochlorite, Aluminium sulphate, Nitric Acid, PAC, etc. Interkapa Ltd is the exclusive distributor of Cumerio for Sulphuric Acid in the region of Greece. It is distributing more than 10000 tons on a yearly basis of Sulphuric Acid, thus covering the majority of the Greek market. 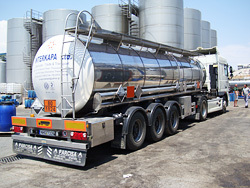 Interkapa Ltd owns its own fleet of bulk roadtankers, which ensures the competitiveness and sustainability of the basic chemicals trade in the Greek market.